During a very brief window of opportunity the first salmon (9lbs) of the 2018 season was caught at Beam on Sunday 25th March by Alastair Blundell. The river dropped just enough between spates, however the river was still very full so this was a very good effort. Since then the river has continued to be practically unfishable with spate after spate, and the whole month of March a complete wash out. 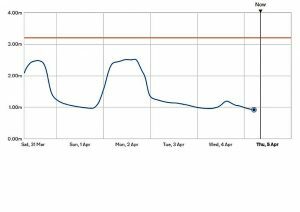 The graph below shows the river level over the last 5 days at Rockhay Bridge Sheepwash, where the water level has barely been below 1m. A good fishing height here is around 0.6m. Some settled weather is desperately needed to allow the river to settle to a good fishing height.